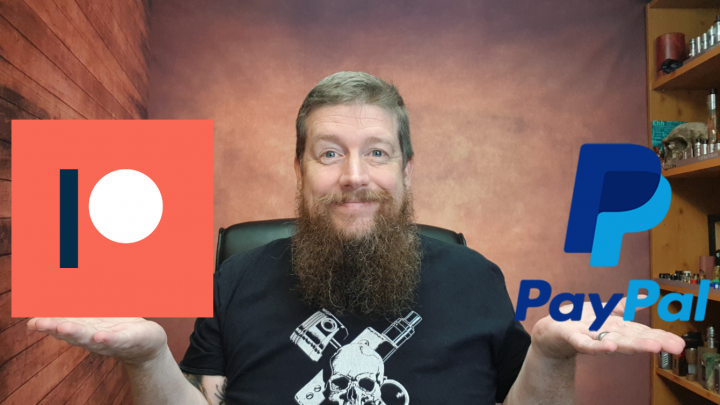 Patreon and Paypal.me, it’s happened. Well I’ve done and done it, if you’ve been around for a few weeks you know this has not been an easy decision for me to make as demonstrated by the article linked at the bottom of this page. I’ve taken your advice on board and arranged both the Paypal.me for a one off donation to the channel, as well as the regular stuff with Patreon. Something important for me to say. I don’t want this section to drag on, but it’s absolutely been one of the supporting factors for going ahead with supporter funding. Since the article at the bottom of this page, I’ve had a crazy amount of support from subscribers and viewers, it’s been truly humbling, but something that has surprised me is the amount of people with disabilities that have contacted me. There’s been emails, and PM’s on FB and Instagram to thank me for showing that you don’t have to be defined by the things that stop you living a ‘normal’ life, or for offering some kind of inspiration, this has been something I wasn’t super aware of until maybe around the time of ‘The Mighty’ publishing an article of mine (‘The Mighty Article’). My Fibromyalgia and Ankylosing Spondylitis (both chronic conditions) have changed me from being a strong, active, oil and gas working bodybuilder, to some days being hardly able to physically get out of bed, as well as dealing with varying levels of pain 24/7. It’s meant I can’t work a normal job, as much as I’ve tried, but while there’s been a lot of personal upheaval because of it, I wanted to make what I love part of my job – and on my own time. I am not someone to give up, and I’m not someone that will sit on my laurels and depend on the state for my support. Helping people away from, and keeping them off of cigarettes, is incredibly powerful, I’m often reminded of that from the kind words people say, but to add on top of that, the fact I’ve in some way given a small amount of inspiration, or a reminder that you CAN do things, you CAN still contribute, and you CAN overcome some of the restrictions of physical and mental challenges is something that regularly leaves me lost for words. So thank you, thank you for the support whether you just watch my videos or like my pictures, or if you decide to help me and the channel continue to grow and become better financially. When I started this journey I never thought it would lead here and I never take a day for granted, and that my friends is down to you. Thank you for the support to get this far, I honestly do appreciate it a lot! Next Post: The CoilArt DPRO RDA, A written review..
Good luck Dean. Life throws challenges our way. We may either meet those challenges head on or not. You are an important part of the world, sharing your story, your love of animals and your love for vaping has helped a lot of people. You are an inspiration. A good decision after a lot of hard thoughts love these reviews very down to earth and fun to watch. Done and Done! I love you and I love your videos and I am proud to be able to support your work! yes,we think it’s normal for us to support reviewer,so many times and efforts they spent,tks really. You gotta do what’s best for you, someone very important to me also has Fybro and she tries really hard to keep going but with other complications, cannot. Like Mark Todd, I find your review and style easy to watch so please never change. You tend to look at vaping products in a different light than many reviewers due to your own situation. When many are dissing a product, like the Nitecore mixer or the daedalus, you’re looking at reasons why these products may be helpful to some people. While some reviewers are trying to make people feel substandard, sometimes unintentionally, for being unable to hold a drill (the vibration causes unbearable pain), you’re looking at how many things can be problematic and helping find a solution. The people who you help simply by attempting to understand, truly appreciate your content and style.